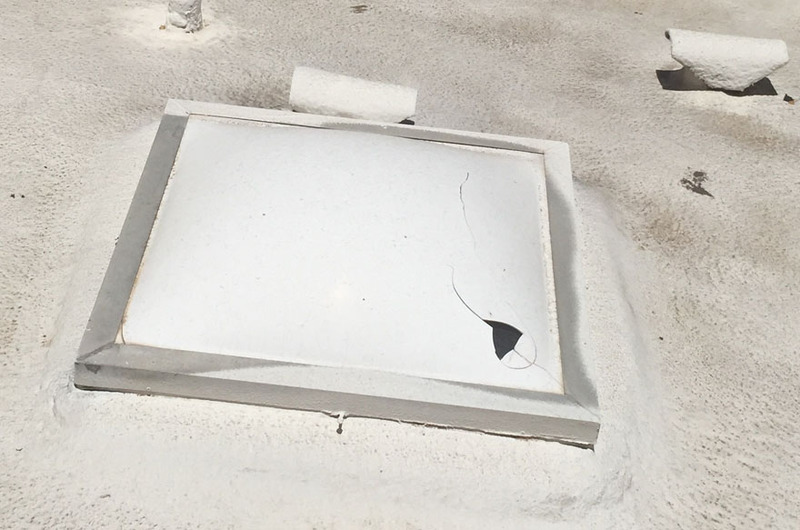 Skylight Repairs & Replacement in Phoenix, AZ | Freelite Inc.
No Other Company in the State Can Match Our Expertise, Workmanship, and—Most Importantly—Our Honesty and Compassion. 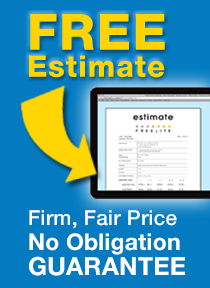 We can diagnose any problem with your skylights and come up with the solution in minutes. 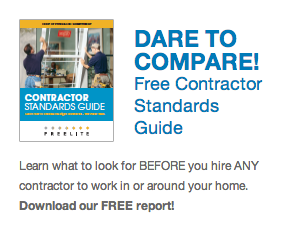 Whether you need to replace your acrylic domes, redo your flashing, or change out your skylight entirely, we’ll always give you an honest assessment. We will NEVER try to sell you anything you don’t need. 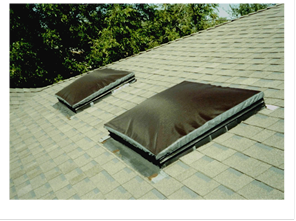 So if you have a leak caused by a roofing issue, for example, we won’t tell you that you need a brand-new skylight, just so we can make a quick extra buck. 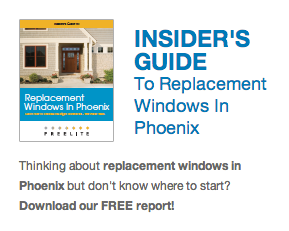 Call (602) 233-1981 right now to set up a convenient time for your FREE consultation and estimate. This is an easy, pressure-free way to get all of your questions answered. What Can I Do About the Heat From my Skylight? 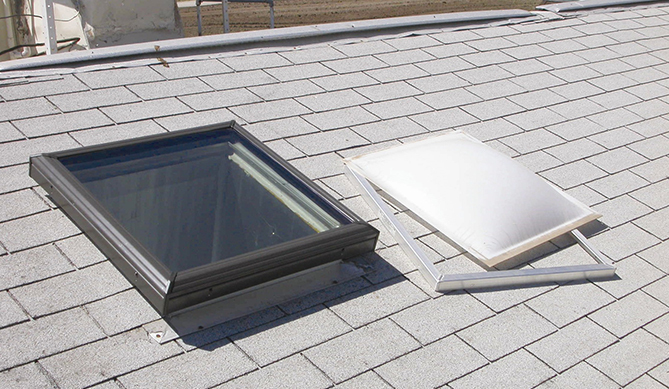 Consider replacing your acrylic dome skylight with an energy-efficient VELUX insulated glass unit. Low E, argon gas-filled glass lets in more light and less heat than plastic domes. Available in both transparent clear and translucent white glass, VELUX products qualify for a 25% state energy tax credit. 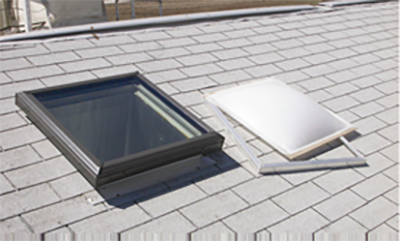 Pricing for a standard 2 x 4’ glass skylight, installed, is around $600.00 (discounts apply on installation of multiple units). a. A HEATBLOCKER shade is a fabric-like mesh with an elastic band that drapes over a skylight much like a shower cap. These inexpensive shades can be removed in the winter when more light (and even some heat) is desirable. Pricing for a standard size HEATBLOCKER shade, installed, ranges from 175.00 to 225.00 (discounts apply on installation of multiple units). b. AZ SKYSHADES are another (superior) approach to exterior shading. Using a patented system, these devices suspend Textilene brand weather-resistant shade fabric above the skylight dome, allowing for air flow which significantly reduces the surface temperature of the acrylic. These shades, too, can be easily removed in winter. And as an added bonus, they work great as golf ball deflectors! Pricing for most AZ SKYSHADES ranges from $275.00 to 500.00, installed (discounts apply on installation of multiple units). The advantage of interior shades is that you can open and close them at will, not unlike turning a light switch on and off. VELUX offers shades for standard-size skylights in a wide range of colors. Available in “Light Filtering” and “Room Darkening” fabric, these shades come either manually operable (with a control rod) or solar-powered (with a remote). The solar-powered devices qualify for a 30% federal energy tax credit (due to expire at the end of 2016) in addition to a 25% state tax credit. Pricing (including installation) for a standard 2’ x 4’ manual blind is around $700.00; a solar powered blind is around 900.00, not including tax credits (discounts apply on installation of multiple units). A crack in the skylight glazing is one way that water can enter. It's normal for rain to get in between the acrylic dome of a skylight and the perimeter frame. Typically, there is a gutter to collect this water; weep holes then allow for it to drain out harmlessly onto the roof. 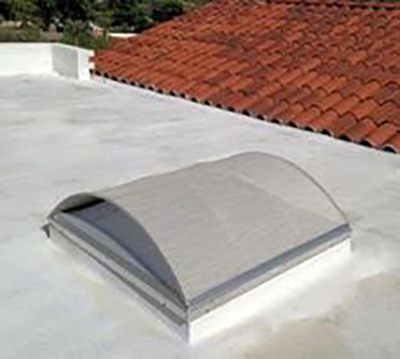 If the weep holes are covered or clogged, the water may back up and overflow the gutter, resulting in a leak inside the skylight shaft. Although not generally a problem in our dry climate, high-humidity areas such as bathrooms sometimes give rise to excess condensation which can drip down from a skylight lens, making it appear as though the skylight is leaking. Often the skylight itself is functioning properly but there's a problem with its integration into the roof system — perhaps a poor seal or a gap in the flashing. A roof problem upslope from the skylight may be the cause of the leak: water gets under the roofing, runs into the skylight shaft and travels down into the room below. Why upgrade your skylight if it's not leaking? Skylights older than five years are a threat to leak because of deterioration caused by years of exposure to our intense desert heat. By replacing your acrylic dome skylight with a VELUX Low E/Argon Gas-filled unit, you’re not only prolonging the life of your skylight, you’re SAVING ENERGY. And all VELUX skylights qualify for an Arizona energy tax credit which means that 25% of the total cost of the job is refunded to you. So the price for upgrading to VELUX is often no more expensive than simply changing out acrylic domes. 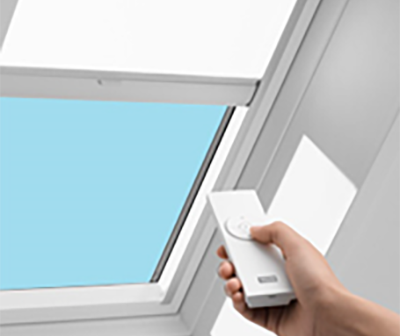 Choosing VELUX means you have the ability to incorporate one of their state-of-the-art shading devices into your new skylight. This gives you total control over the light and heat entering your home. VELUX shades come in a wide variety of colors and are available manually operable, electric, or solar battery powered. Some qualify for state and federal energy tax credits!